He didn't hang it up, but his characters did. A playwright friend posted on Facebook, “Give me one reason not to hang it up.” As a playwright, he clarified, after someone commented all concerned about his kids. He added that the market for new plays is brutal. This guy is a very fine writer. His plays have eerie humor and oddly vulnerable characters and mystery. The pivotal moments stay in your head. Is this all a reason not to hang it up? I want it to be, but no. It’s not about talent. We all know our voice is unique, and most of us have heard “if you block it, it will never exist…The world will not have it.” Sometimes the thrill of those stakes carries me through a bad day, sometimes I just think, “It’s not like the world will know the difference.” Is that a reason to hang it up? I think that if this playwright hangs on he will get produced, and people will love his work. But of course I can’t be sure. It takes a lot of decisions to get a play to the stage, and a playwright is in control of only one of them. I’ve been reading a lot of George Gissing novels lately. He was a Victorian novelist who wrote a lot about people in poverty. In most of his stories, my favorite character gives up or flat-out loses while other, less appealing characters triumph. Each ending depresses me, but back I go to Project Gutenberg for another one. I love the way characters pass in and out of chapters, and how tenderly Gissing writes about the cruel things that happen in the course of a poverty-stricken day, and how every now and then he throws me a crumb of hope. I just finished New Grub Street, where novelist Harold Biffen (a minor character) finally poisons himself in a park (so he won’t upset his landlady) after his novel Mr. Bailey, Grocer (a deliberately undramatic account of the life of a grocer) is poorly received, and his heart has been broken by a woman who is merely polite to him, and he is starving and his clothes are too worn out for mending. The last image in the book is a scene with Jasper Milvain (the guy who started out as the hero but ditched the woman he loved to marry someone with money) and his wealthy wife. He confesses he feels sorry for the girl he jilted, but his wife helps him admit that the girl would have led him to poverty, “and poverty and struggle…would have made me a detestable creature.” He asks his wife to play a tune on the piano. “So Amy first played and then sang, and Jasper lay back in a dreamy bliss.” The end. I looked Gissing up and learned that he was a promising young man who fell in love with a prostitute, resorted to stealing in order to support her, went to prison, and spent some time in the United States rebuilding his career and life. 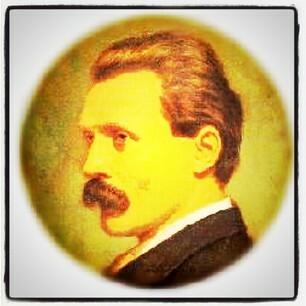 Gissing lived through disgrace and prison and two failed marriages, and still wrote 22 novels. Is that a reason for the rest of us to persevere? I want to adapt New Grub Street into a play or a BBC teleplay, but whenever I start outlining in my head I realize all the things that would likely make a producer take a pass, assuming I could even get it into the right hands. Too many characters with the same narrative weight. The hero’s journey dead-ends. No celebratory ending like in Dickens or Austen, though some of their costumes could be re-used. I don’t know one reason to try an adaptation, except that I kind of want to. Not desperately, the way I desperately want to get back to reading The Unclassed, but I suppose I’ll give it a try. And not because if I don’t the world will not have it. Apologies to Martha Graham, but someone else would probably write a very similar version, and theirs would probably get produced. And if they did and I had to watch it, I’d be like, “Aw, I coulda done that.” But I wouldn’t be quite sure that I could have. I guess my reason not to hang it up, when the other reasons aren’t working, is that I’d rather be not quite sure about the future than not quite sure about the past. You nailed it with that last sentence. Wow. I agree with Dave. Bravo, well said! or “there is a difference between being served a bowl of chicken soup with love, tenderness, concern.” And having a bowl of chicken soup thrown on the table with a “here”….